Sometimes as expats, we complain a lot. The Frau loves to complain. Don’t most people? It’s entertaining, it’s fun, and it’s a heck of a lot easier to complain about something than to fix whatever it is you’re complaining about. Switzerland has terrible Mexican food. Switzerland has too much fog. In her Swiss career, The Frau has done her fair share of complaining. Had her fair share of Migros Moments. Had her pretty little expat bubble burst more than once. For instance, seven years ago, The Frau often complained that there was no English writing community in Zurich. But what the heck did she think she would find in a German-speaking city known more for banks and lawyers than the creative arts? Who cares? The Frau complained anyway. But then something crazy happened. After about four years, The Frau decided to stop complaining and start creating. She started asking not what Switzerland could do for her, but what she could do for Switzerland. So in 2010, she got together with two other Zurich-based writers and started the Zurich Writers Workshop. It wasn’t easy. They were scared no one would come to their big event. They were scared that they could lose the money they’d invested in their mission. But there was one thing they weren’t scared of: their belief that if they thought Zurich needed an English-based writing community then others would think so too. Now The Frau is pleased to announce the fourth annual Zurich Writers Workshop, which will take place April 12-14, 2013 in Zurich and feature stuff like inspiration, learning, and creativity. The one thing it won’t feature? Complaining. 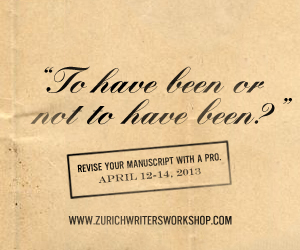 So join The Frau at the next Zurich Writers Workshop. Or if that’s not your thing, at least join her in her newfound expat mission to create rather than complain. Because as expats, more often than not, what we’re looking for in a place we move to probably isn’t there. So it’s up to us to create it. Register now for The Frau’s creation, or create your own and let her know about it so she can celebrate it in a future post. Have you found your place in Switzerland by creating it yourself? Leave a comment. The Frau would like to promote it in a future post. I don't know if I will ever be able to stop complaining, though. It might be because I'm British. Americans don't moan so much, I've noticed. Exactly. Complain. But then create. In Basel I started a group for writers for children. In Qatar I started a group for mum writers. Just this weekend I started giving more organized writing workshops. And I've got a whole slew of other things in various stages of planning, pre-launch, etc. Create. And here's to the other creators out there! Kooki, do you have a website for your Basel group? Would be great to let people know about that. There is a lot you can do in even what seem restricted circumstances that don't take money or much planning but just the will to get people together. Yes, in many cases, willpower is all you need!